Five out of six of Syria's Unesco World Heritage sites have been "significantly" damaged by the country's civil war, satellite image analysis has revealed. Historic structures across the country, including ancient mosques, government buildings and castles show signs of destruction - with some reduced to rubble, researchers from the American Association for the Advancement of Science (AAAS) say. The only site that appears to remain relatively unscathed is the ancient city of Damascus. "From our contacts and sources in Syria, we knew that there was damage to World Heritage sites," says Brian Daniels, of the University of Pennsylvania Museum, which partnered in the research. "But this report surprised us by revealing just how extensive the destruction actually is." Some of the most extensive damage is in Aleppo, one of the oldest continuously inhabited cities in the world, the satellite image analysis reveals. The northern Syrian city, which dates back to 2,000BC, has seen some of the heaviest fighting of the civil war. 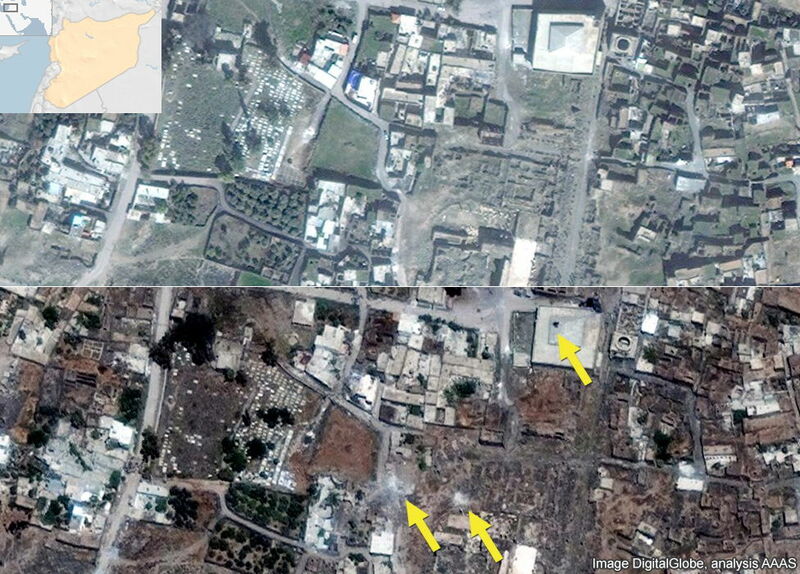 Images captured in 2011 and 2014 reveal damage to the city's Great Mosque - one of Aleppo's most famous cultural sites. Its 50m-tall Seljuk minaret, dating from 1095 and considered one of the most important monuments of medieval Syria, collapsed as a result of shelling in March 2013 (red arrow). There are also two large craters along the mosque's eastern wall (blue arrows). There is also significant damage to the south of Aleppo's citadel, the location of many historical government buildings. 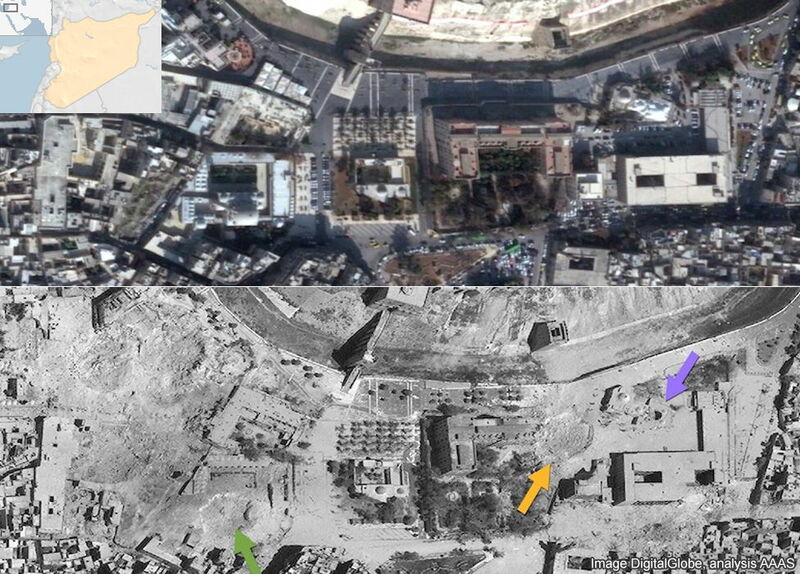 Between December 2011 and August 2014, the city's Khusriwiye Mosque was demolished (green arrow) and the Grand Serail - the former seat of the Aleppo governor - was heavily damaged (orange arrow). 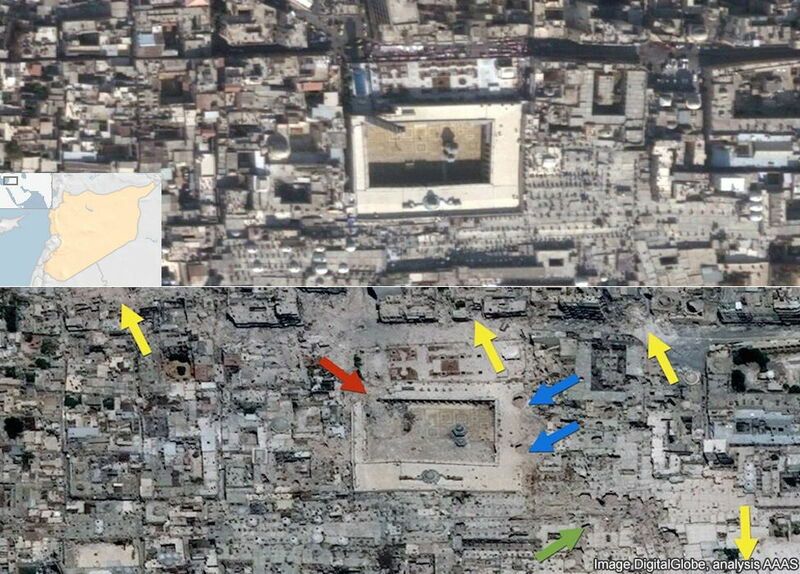 The dome of the 15th Century Hammam Yalbougha an-Nasry - one of Syria's finest bathhouses - has also been destroyed (purple arrow). The ancient city of Bosra, located in the southern Daara governorate, contains ruined buildings from the Roman, Byzantine, and early Islamic periods. Between October 2009 and April 2014, a number of probable shell craters appeared within the site, including a hole in the roof of the Al-Omari Mosque. Palmyra's Greco-Roman and Persian ruins, located in the middle of the Syrian desert, were one of Syria's main tourist attractions before the conflict. Imagery analysis has revealed how the site and its surrounding area - including its Roman theatre - have suffered from the effects of shelling, activity by snipers as well as the presence of rocket launchers and tanks. There are also persistent reports of looting. 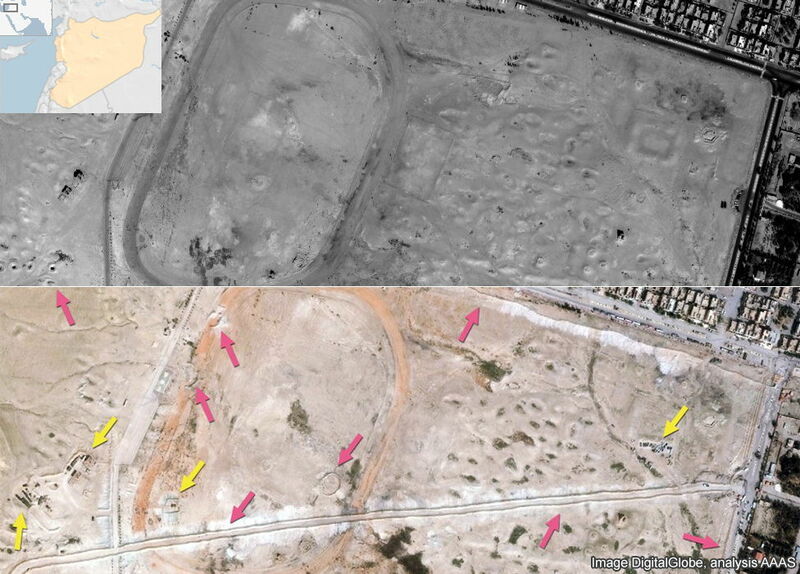 New roads can be seen across the northern area of the site as well excavated fortifications (pink arrows), providing cover for military vehicles (yellow arrows). The ancient sites of northern Syria, comprising eight parks and a total of 40 villages, have suffered due to their close proximity to a key Turkish border crossing, used as the entry point for supplies. A number of Syrians who have been forced from their homes are also living in and among the ruins. Analysis of satellite images of the Jebel Barisha park show the creation of three compounds: two within the park boundaries and one just outside. They appear to have a military function, according to the AAAS. The castle of Crac des Chevaliers, dating back to the 11th Century, has been used as a hideout by rebel gunmen and has been repeatedly shelled by government forces. 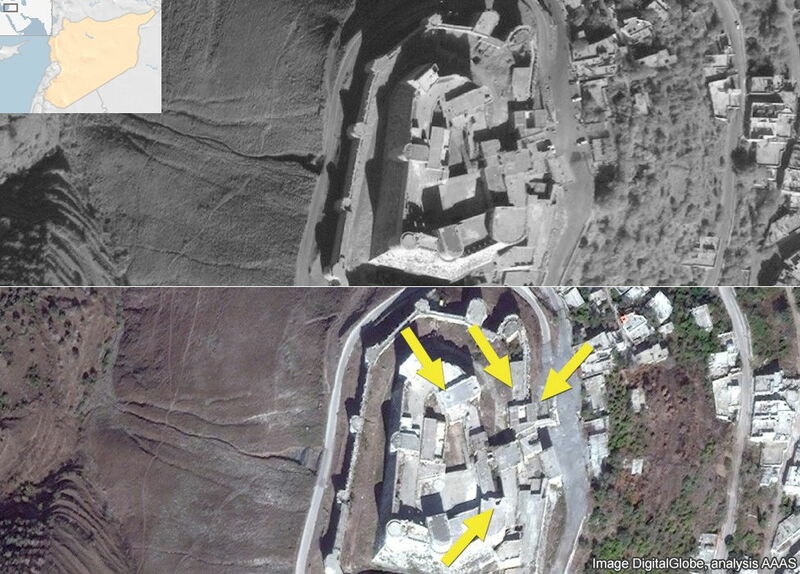 Analysis of satellite images of the site, west of Homs in central Syria, reveals damage to the castle's south-east tower. There are also craters to the north. All of Syria's six World Heritage sites are on Unesco's list of World Heritage in Danger, maintained by its World Heritage Center. Corine Wegener, cultural heritage preservation officer for the US Smithsonian Institution, said Syria required support from the international community to help "mitigate and prevent damage to cultural heritage" amidst the conflict. For more satellite images and analysis, visit the American Association for the Advancement of Science report page. Written by Lucy Rodgers. Design and development by Gerry Fletcher and Richard Bangay.